Get The Top Tips For Sunday's Big El Clasico Clash in La Liga! What Are The Top Tips for this Weekend’s Huge El Clasico Clash in La Liga? The last time Real Madrid took on Barcelona in a game that didn’t feature either Lionel Messi, Cristiano Ronaldo or both, was way back in 2007. That day, Real Madrid were celebrating after a goal from Julio Baptista handed them a 1-0 victory. Roll on 11 years and it seems incredible to think that this Sunday’s game will be the first not to feature either player. That’s because Cristiano Ronaldo is now, of course, no longer a Real Madrid player after securing a £90m move to Juventus at the end of last season. His great rival, Lionel Messi, remains an integral part of the Barcelona team but an arm injury picked up recently means that the Argentinean genius will miss around three weeks of action, including Sunday’s big clash at the Nou Camp. 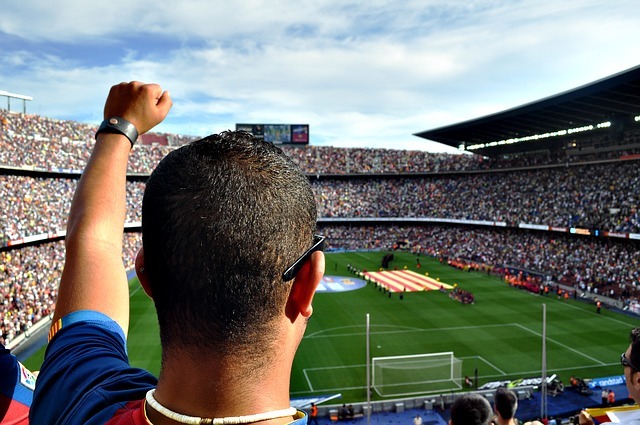 The game will always attract plenty of betting and we are going to bring you our tips on the game later in the article, after we have previewed how the season has gone so far for both teams and what the most likely line ups for both teams will be. 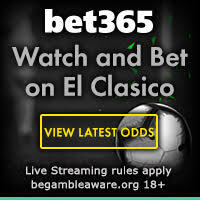 As always, bet365 Sport is a great site to place your bets and if you are not yet a member you can sign up today using the latest bet365 Sport New Player Sign Up Offer. It is easy to see that Barcelona have had a generally stronger season, apart from a run of three games without a win. Real’s season started poorly but they bounced back well, but in their last four games, they have lost three and their only win came over Viktoria Plzen in the Champions League, a game which proved costly in other ways as it saw Marcelo limp off the field due to an injury that will keep him out of the game at the weekend. It is this run of poor form which has heaped the pressure on Real Madrid’s new manager Julen Lopetegui. The ex-Spain boss only took over from Zinedine Zidane in the summer but has found it hard to replace Ronaldo’s impact and goals in the team and the net result has been a below par season so far for Real, though the manager may not have been helped by the club not bringing in a direct replacement for the Portuguese legend. Who Will Start for Both Teams? With Lionel Messi injured, it is a question of who will get the nod in the team to play alongside Suarez and Coutinho as the main attacking thrust. Rafinha has been that player of late and he has done a good job and I think he’ll get the nod here ahead of Dembele. Arthur may come into midfield alongside Rakitic and Busquets and the defence, while not impressing this season, is likely to remain unchanged for the visit of Real. Marcelo’s injury combined with the sale of Ronaldo in the summer, robs Real Madrid of two of their team’s most influential players of the last few years and as such, I think this will be a tough afternoon for them. Odriozola, the young full back signed from Real Sociedad in the summer, could come in for Marcelo while Benzema will likely continue in attack with Bale or Asensio being the one who may drop to the bench for the game. For me, this is Barcelona’s game to lose, even with Messi out of the team injured. Real’s lack of form and confidence, plus the absence of Marcelo, a key figure for them, makes me think that Real are ripe for the taking here. 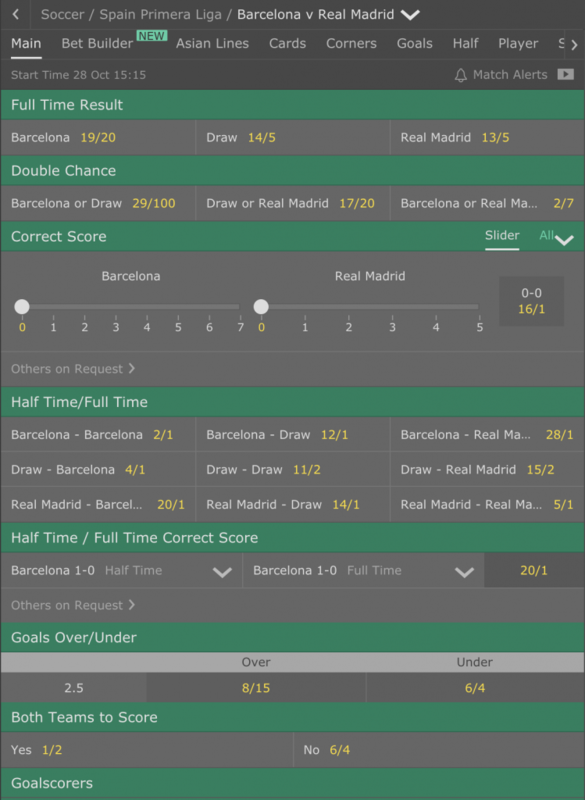 With Coutinho, Suarez and Rafinha in particular looking lively, plus Dembele available if they so need, Barcelona should have more than enough quality to get the result they want from this one and at just shy of even money, I feel they are a good value bet in the Full Time Result market with bet365. Given the quality of attacking player that is missing from this game on both sides of the field, I can’t see this El Clasico having the sheer number of goals that have been prevalent in some of the games in the recent past. That said, I think with home advantage plus the calibre of the likes of Suarez and Coutinho in the team, Barcelona have more than enough weaponry to score a couple of goals. Similarly, Real have so much pace and quality on the counter that I feel they can score once against this leaky Barcelona back line. As such, I feel that 2-1 at 15/2 is the best option to take here.